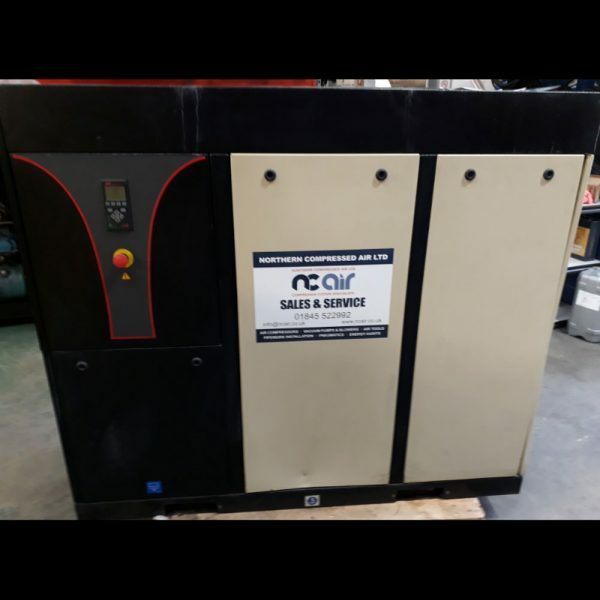 Ingersoll Rand 22kw Screw Compressor, 2006, 125cfm at 7.5barG standalone model. Less than 3000 run hours and in excellent conditions. Small, quiet and compact but has high output performance. Perfect for somewhere looking to upgrade an older compressor. Also available for hire. 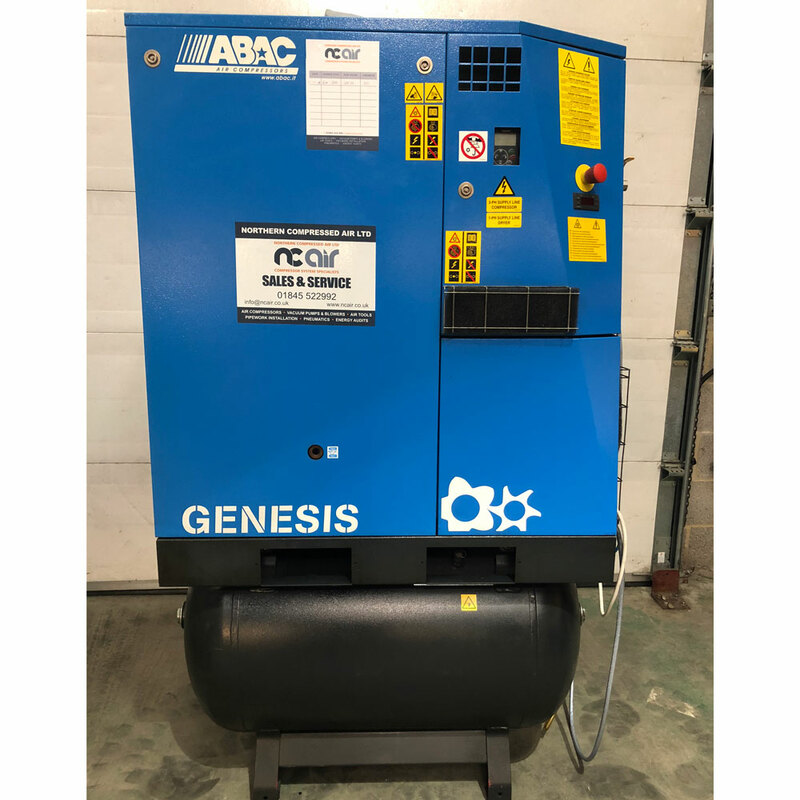 ABAC Genesis 11i, 2012, variable speed screw compressor with integral dryer filters and air receiver. Fully overhauled with new air end, motor and rebuilt inverter. Fully serviced and has full service history from day one where it has been maintained with top quality spare parts and lubricants. 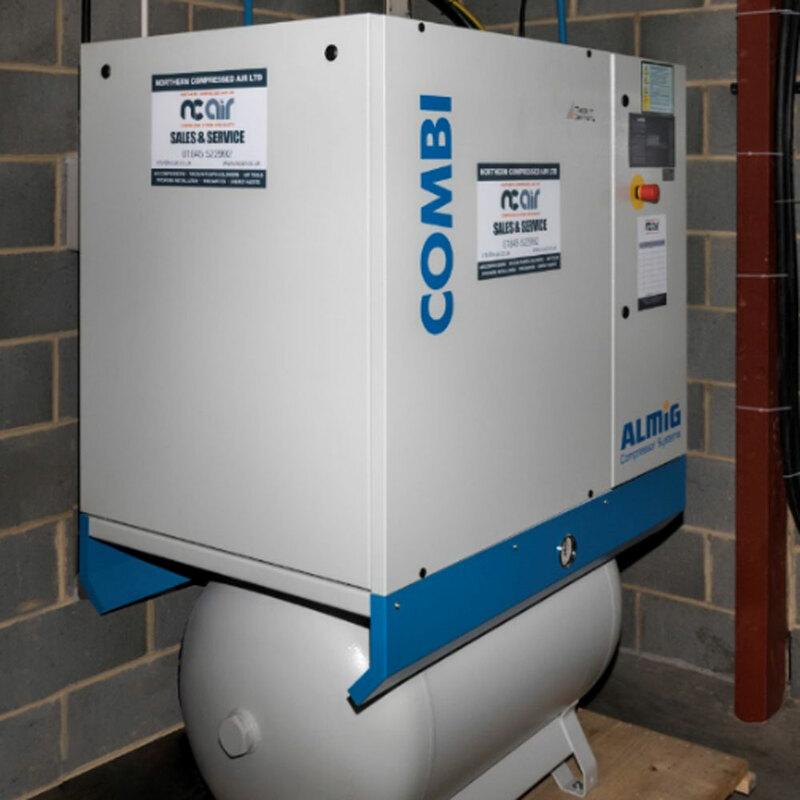 As this compressor is inverter driven it is classed as an energy saving compressor as a complete package. Also available for hire. 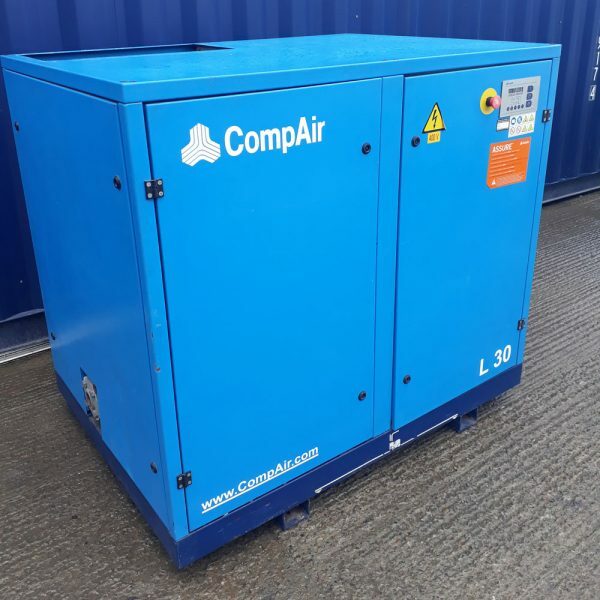 CompAir L30 30kw Screw Compressor, 2006, 175cfm at 7.5barG standalone model. Less than 13500 run hours and in excellent condition. Air cooled with Delcos Pro controller which features full digital read out, fault messages, digital output options plus many more functions. 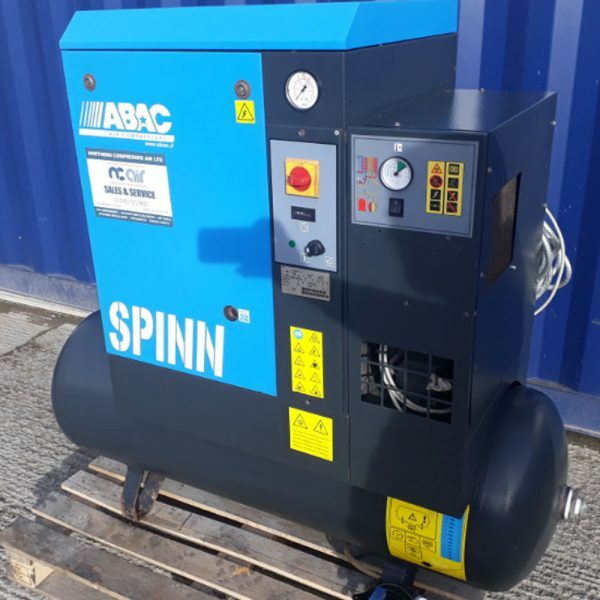 Abac Spinn 5.5kw Screw Compressor, 2012, 22cfm at 10barG standalone model. 3000 run hours and in excellent conditions, fully services with 6 months warranty. Small, quiet and compact ideal for small manufacturing of workshop using spray equipment and air tools. 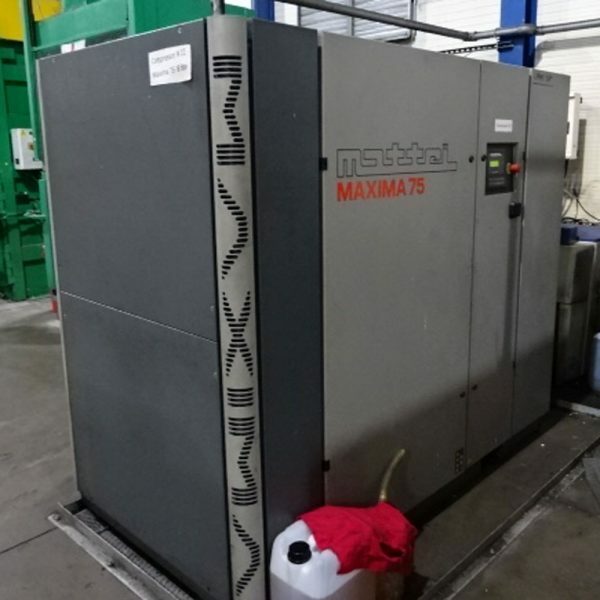 Mattei Maxima 75, 75kw Rotary Vane Compressor, 2009, 562cfm at 7.5barG standalone model. 60,000 run hours and in excellent condition with full manufacture service record. The Maxima range is an award winning compressor for the high output and low energy consumption. Air cooled with Maestro controller which features full digital read out, fault messages, digital output options plus many more functions. Perfect as a large base load compressor to offer optimum savings or as a back up to a current installation. 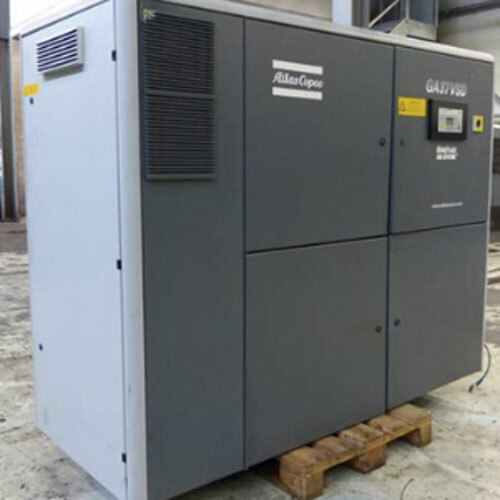 Atlas Copco GA37vsd, 37kw Variable Speed Rotary Screw Compressor, 2006, 250cfm at 7.5barG standalone model. 50,000 run hours and in excellent condition. As this compressor is inverter driven it is classed as an energy saving which is ideal for a site looking to reduce their energy bills. The compressor is Air cooled with Elektronikon controller which features full digital read out, fault messages, digital output options plus many more functions. 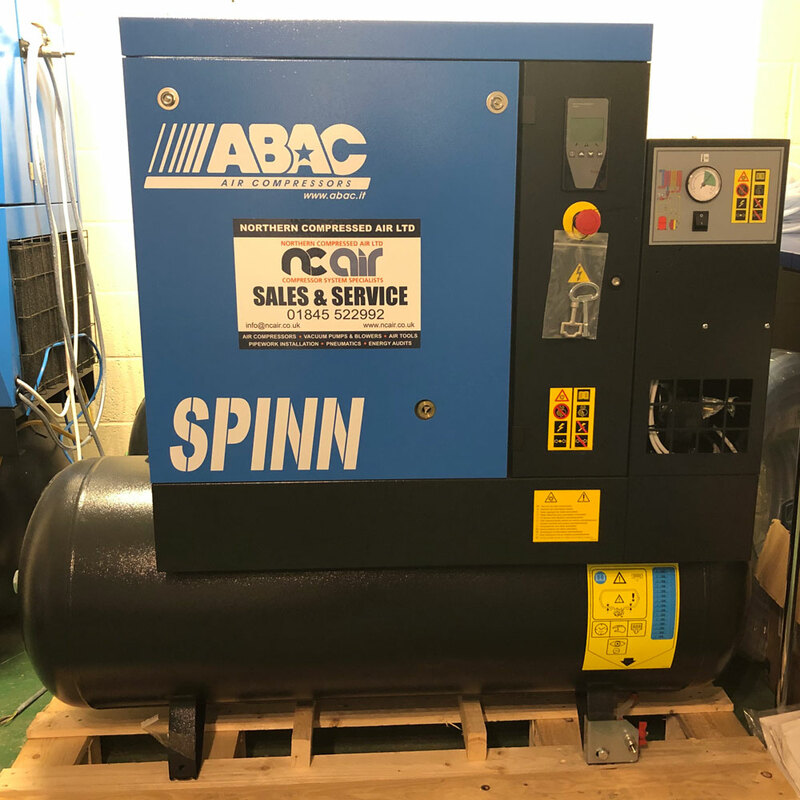 Abac Spinn 7.5kw Screw Compressor with integral fridge dryer mounted on a 270ltr air receiver, 2014, 35cfm at 10barG Air station / Full Feature Model. 16000 run hours and in excellent condition, fully serviced with 6 months warranty. Small, quiet and compact ideal for small manufacturing of workshop using spray equipment and air tools who are new starting and new a complete packaged compressor solution. 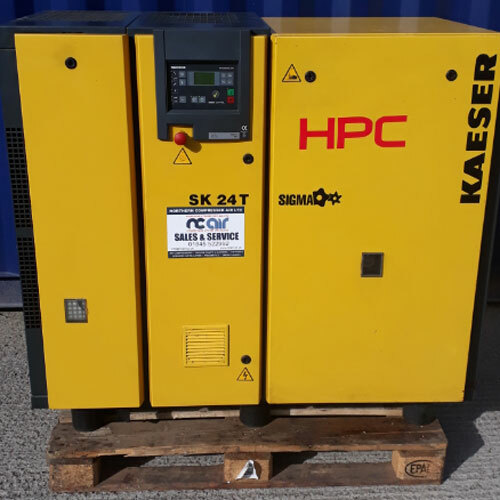 HPC SK24T 15kw Screw Compressor with integral fridge, 2008, 85cfm at 10barG. 46000 run hours and in excellent condition, fully serviced with 6 months warranty. A quiet solid compressor with a Sigma controller which features full digital read out, fault messages, digital output options plus many more functions. 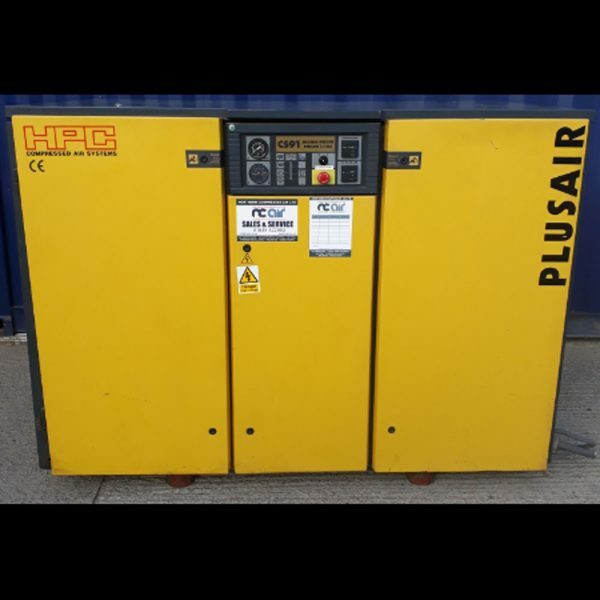 HPC CS91 55kw Fixed Speed Screw Compressor, 2001, 325cfm at 7.5barG standalone model. Less than 60,000 run hours and in excellent conditions. Slow running basic compressor with a simple controller. Perfect for somewhere looking for a reliable back up compressor or high output for shot blasting operation. 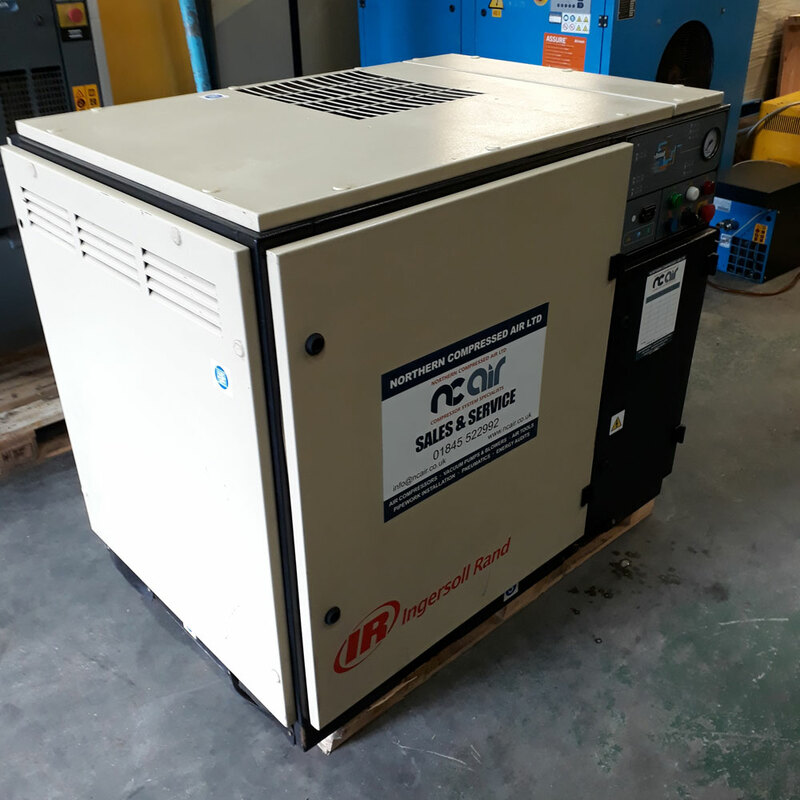 Ingersoll Rand Nirvana 22 VSD, 22kw Variable Speed Rotary Screw Compressor, 2010, 40 – 130cfm at 10barG, standalone model. 12,000 run hours and in perfect condition fully serviced. As this compressor is inverter driven it is classed as an energy saving which is ideal for a site looking to reduce their energy bills. The compressor is Air cooled with digital controller which features full digital read out, fault messages, digital output options plus many more functions. 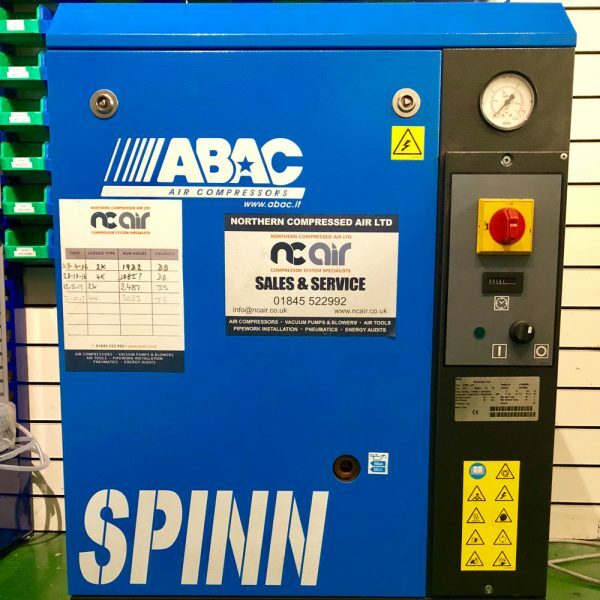 **EX DEMO** Abac Spinn 5.5kw Screw Compressor with integral fridge dryer mounted on a 270ltr air receiver, 2019, 25cfm at 10barG Air station / Full Feature Model. 160 run hours and in excellent condition, full warranty still available. Small, quiet and compact ideal for small manufacturing of workshop using spray equipment and air tools who are new starting and new a complete packaged compressor solution. Almig Combi 15kw Screw Compressor with integral fridge dryer mounted on a 270ltr air receiver, 2017, 70cfm at 8barG Air station / Full Feature Model. 4200 run hours and in excellent condition, still under manufacturer’s warranty. Quiet and compact with a small foot print. A complete packaged compressor solution. 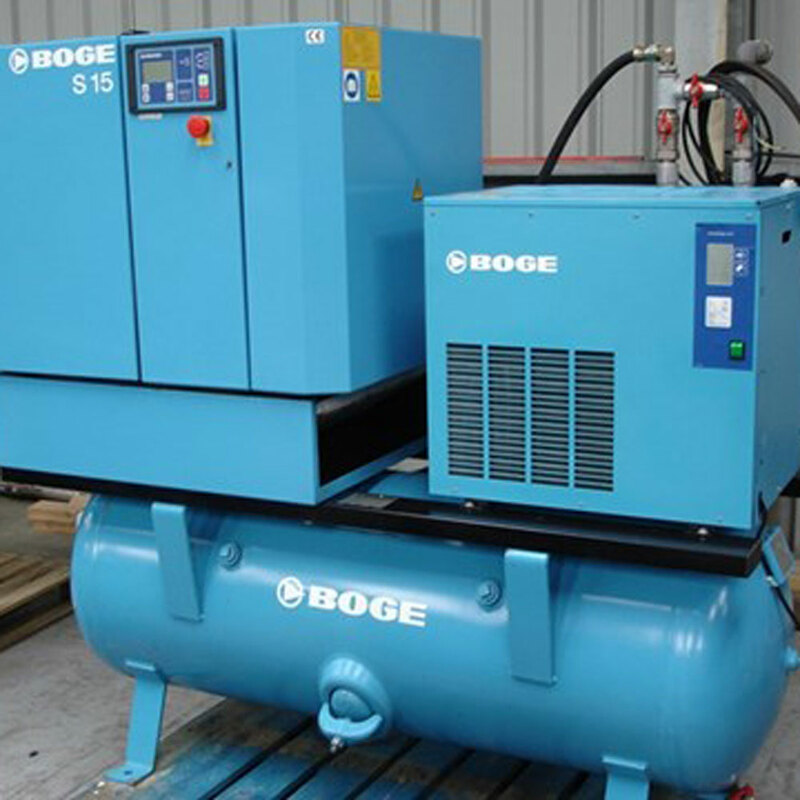 Boge 11kw Screw Compressor with integral fridge dryer mounted on a 270ltr air receiver, 2008, 58cfm at 8barG Air station / Full Feature Model. 18000 run hours and in excellent condition with recent overhaul. A complete packaged compressor solution.